Carrier Class infrastructure centered around providing telecommunication services is a thing of the past. What used to be the expected of the telecom equipment manufacturers in terms of reliability and availability is now expected of any equipment that is designed to provide converged telecom and datacom services.Ascend’s team has been involved in designing many carrier class systems from concept to completion, seeing them through initial customer deployments and verifications with all the world class carriers.The technologies involved, Core Routing, ATM Switches, Sonet STS-1 Granularity Cross Connect Switches, Optical DWDM Switches and Multiplexing Systems and Integration of IPoDWDM into pure Datacom Solutions. Expert’s in Ascend’s management were the first to bring the 10G OC192 solution and the 100GE Solutions to the Market. Ascend offers consulting and guidance on designing carrier class solutions to its established and growing base of cusomers world wide. The Cisco CRS-1 Carrier Routing System is the industry’s only carrier routing system offering continuous system operation, unprecedented service flexibility, and system longevity. Powered by Cisco IOS XR Software, it is designed for always-on operation while scaling system capacity up to 92 Tbps.Ascend is a Cisco channel partner that has experts who have worked on designing the CRS system and the IOS-XR software and have, worked issues related to the first installations of the system at Major carriers and have extensive exposure to issues faced by the carriers during deployment.Ascend has establised a niche around sales of CRS gear and services to clients of all over the globe. For more information on Cisco’s fantastic Carrier Routing System CRS-1 and products and services provided by Ascend, please visit the CRS-1 page. Facilitate the evolution of Carrier Ethernet networks by setting a new foundational baseline for the edge. This foundation starts with the exceptional scale delivered by Cisco ASR 9000 Series Aggregation Services Routers, up to 6.4 terabits per second (Tbps) per system. 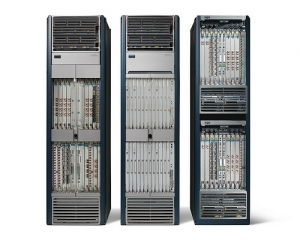 The Cisco ASR 9000 Series delivers a true carrier-class solution by using the modular, microkernel-based Cisco IOS XR Software operating system, comprehensive system redundancy, and a full complement of network resiliency schemes. The Cisco 12000 Series is the industry’s premier next generation Internet routing platform featuring the capacity, performance, service enablers, and operational efficiencies service providers require for building the most competitive IP backbone and high-speed provider edge networks. With over 20,000 units installed, the Cisco 12000 Series Internet Router is the most broadly deployed high-end IP router in the industry today.